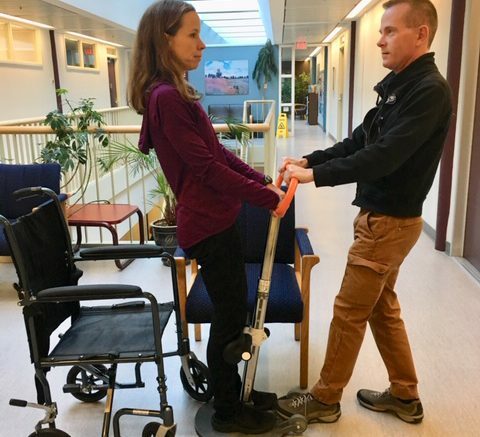 Chilliwack – Primary and Community Care physical therapist, Jeff Fredrick, demonstrates the latest addition of mobility equipment with a fellow colleague at the Community Care office. “Having the turner pro available in the Community Care office allows rehabilitation and nursing staff to trial the device in the client’s home to determine if this is a viable option for mobilizing the client safely once they are discharged,” said Fredrick. “Training can be offered to nursing staff in the Fraser Valley Health Care Foundation – Community Care office so they are aware of mobility options as a significant number of the community care client referrals are not hospital discharges,” he explained. The Turner Pro is used to transfer clients from sitting into a standing position. Then the unit swivels so the client can be seated onto a commode or wheelchair. There are several of these non-mechanical transfer devices now in use in the hospital but there is a need for them in the community. With a price of $995, the Turner Pro is cost prohibitive for short term use, so Fredrick was hesitant to recommend clients purchase them. Until recently, this type of equipment was not available for rent from medical supply stores. “Since acquiring the Turner Pro with funding from the Fraser Valley Health Care Foundation, I have consulted with the community private vendors to ensure they have units available to rent or purchase,” explained Fredrick. There will be an increased demand for this piece of equipment as it becomes more familiar to clients and Community Care staff. Both local vendors now have units available in their shops. For More information or to support, please visit www.fvhcf.ca or call the FVHCF office at 1-877-661-0314. Be the first to comment on "Fraser Valley Health Care Foundation New Acquisition – Turner Pro To Aid In Mobility"